South America 2012: Comida - ceviche, our host familia, and vivir en Ecuador. Comida - ceviche, our host familia, and vivir en Ecuador. We are staying with a host family who speak no English (except for a teenage son who rarely comes out of his bedroom) while we are at Academia Latino Americana. We catch the EcoVia which is 4 stops, and usually so crowded you literally have to push your way in - they need those Japanese station dudes. We have been warned on numerous occasions not to carry valuable items, and only enough cash for the day. So far so good. Communication (para mi) is excruciating, but David is loving it. David enjoys the conversations with the padre (father of the family, not the local church dude) after dinner. But it's amazing how food crosses boundaries. I offered to cook one night (if you know me well, don't fall over!). The request was for comida typica Australia. Unfortunately I could not find kangaroo after trawling Quito from one end to the other :) So I settled for spaghetti Bolognese. They really enjoyed it. The food here is nice, but in some ways quite plain compared to what we are used to. They tend to spice things up with salsa rather than putting herbs and spices in the cooking. There are many varieties of tropical fruits here I have never seen, and so far all have been delicious. Fresh fruit juices (jugos) made on the spot are common, and come in any variety or mix. A la Boost Juice but heaps better, and only cost about 50c. Wine is muy expensive because of import duties so we have not been drinking it. The beer is good and barato (cheap). Today we were invited home for lunch to enjoy comida typica Ecuadoriana. It was ceviche, and it was to die for. To mop up the soupy part they provide popcorn, and dried cooking bananas. I was pleasantly surprised how nice the combination was. We thought we would have the meal in the house we are staying in, but instead we went to the padres madres (mothers) apartment. The apartment was a pent house with an amazing view across Quito. The almuerzo was served as 3 courses, the first of which was the ceviche - all done by the hired help. Hired help here is standard practice for middle class families. Our family has a live in house keeper, her husband (who does most of the cooking) and 3 young children, all living in a tiny flat at the back of the house. They are the loveliest family. So each day our bed is made (re made actually) and the room, and bathroom are cleaned, and our washing is done on Fridays. We have unlimited wifi access throughout the house, and our breakfasts and dinners are part of the deal. All of this for $20 per night each. Mi español is coming along. I understand a reasonable amount now if the conversation is simple. I'm hopeless at regurgitating what I have learnt in the form of speaking; my brain does not work fast enough. I have to stay in the present tense, which is really frustrating but I don't understanrd past and future tenses yet - despite some teaching. I must be a frustrating pupil. My brain is having much trouble remembering basic verbs, but I am getting better at conjugation when I can see the verb in writing, or hear the ending clearly. Conjugation is all very well, but putting the correctly congugated verb into a sentence is a whole other thing I cannot do yet - except occasionally. Tomorrow mi profesora is taking me to the main food market in Quito. Apparently it's quite something. I'll get to see the fruits I've tasted in the jugos. But here is the rub - I have to speak to the stall holders in español. Simple stuff like asking a price, or answering a question about where I come from (we look muy diferente). I feel quite insecure about it because every time I go to speak in public I forget everything, or can't pronounce it in a way they understand. Looking forward to getting my head out of the books and muchos la tarea (homework) of 1-2 horas per dia, and going to the Galapagos next week. 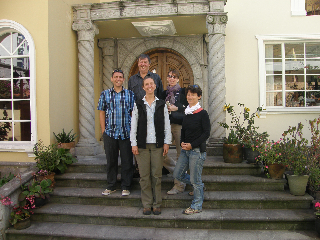 The photo is taken on the steps of our Spanish school. It's David and me with the other students who started the same week as us.